Part of what one learns from being chair is the inescapably material character of academic life, how the academic fabric is woven in our workplaces. It is a good thing to keep the economic underpinnings of the enterprise front and center for colleagues, helping them to balance their idealism against the many competing, often economic, priorities that departmental discussion and decision-making need to take into account. What Can I Do With an English Major? I thought followers of the ADE/ADFL Commons might be interested in the “New Updates to Language Indicators.” Here is the PDF of the Indicators report on languages and the link to their website. 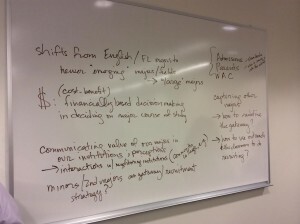 At the 2015 ADE-ADFL Summer Seminar East, Lina Insana (University of Pittsburgh) and Emily Todd (Westfield State University) ran a discussion group on the challenges of recruiting and retaining majors….